Earlier this week I shared the story of how we found our new home. On the way back from our house-hunting trip--the day we put in an offer on the new place--we started talking about selling our current house. Our three hour drive resulted in a game plan. We'd finish up a couple loose-end projects while contacting some friends who may be interested in buying. We could show it to any of them while we were finishing up the projects. We'd stick a sign in our yard for good measure and maybe even do an ad in the paper. If a couple weeks passed without any significant developments we'd try another avenue--most likely with a local realtor. I sent informal Facebook messages to a handful of people I thought may be interested. A couple people showed mild enthusiasm, but nothing earth shattering came to fruition. I was still talking with a few potentials a couple days later when I got my own Facebook message--from a former college classmate/acquaintance/Facebook friend. She and her husband (we'll call them the buyers from here on out) were having dinner at our neighbor's house and were told we were moving. After dinner our neighbor shared photos of the house from right here on the blog. They even apparently dove deep into the archives in their blog exploration--which makes me kinda excited because I think the only people who read some of those early blog posts were my family. More readers--yay! When the buyers retrurned to their rental home that night she sat down and messaged me, telling me of their interest in our place and asking if they could schedule a time to look at it. Imagine me, popping into Facebook the next morning and seeing a new message waiting for me. Imagine my giddy excitement when I read what the message says. Imagine my high-pitched, fast-paced recount of it to Mike. Imagine me literally jumping up and down saying all sorts of things from "hallelujah" to "did-that-just-happen???" as I read the message again. Ok, now that you've imagined me acting like a complete crazy lady (my poor husband) picture me taking a deep breath to collect myself before quickly typing a response--not just any response; a calm, cool, collected response. Brief but conversational; friendly but professional. A response that would do everything but let on the reader of my crazy side. After exchanging a few messages, the buyers showed up at our exceedingly clean doorstep (pretty much every surface of the house was cleaned with a toothbrush immediately before they came. Ok, not really, but you get the point: our place was clean.) We handed them a flier giving a detailed listing and let them poke around for awhile. They we sat down and visited--mostly about the house, but of other things as well. They were friendly like that--not making me feel like the crazy woman that I am. ha. The next morning I popped over to Facebook to check in on my social universe and BAM--another message from the buyer. She and her husband were very excited about the opportunity and were wondering if they could bring his parents with them during a second visit in a few days. Can you bring family over for another peek? Meaning you're still interested and may potentially put in an offer on our lovely little home that we've put so much of ourselves into? Can you? Um, yes! They came over a few days later with the fam and put in an official offer later that day. While we haven't finished all the paperwork, we're both well on our way to buying our new homes. I'm so excited for the day we get to officially hand over our keys. After working so many hours on this house, it's exciting to know another young couple will be able to love it and put their own stamp on it. And they're already friends of our neighbors. Can it get much better than that? So yes, we're selling our house without a realtor (at least not a paid realtor. 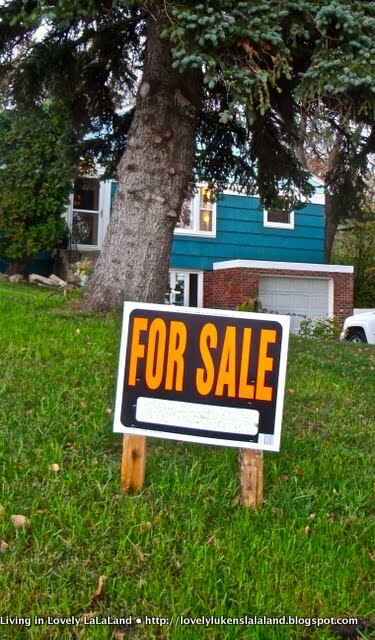 I think our neighbor did a pretty good job of selling it even before we got involved.) But no, it wasn't done conventionally, or intentionally for that matter. God's hand was heavily involved. We're humbled and grateful--we're in awe. And we're one step closer to the next chapter of our lives. What a great story! I'm so glad you guys found a buyer so quickly and easily. =) I'm dreading when we put our townhome up for sale- townhomes are just not doing well on the market these days! Wow, sure sounds like all the signs are there that your move is meant to be. Congrats on selling your home through social media and word of mouth. Best wishes that it all goes smoothly. Congrats! I was thrilled when we sold our house while moving to town - you just never know how short or long your house is going to sit on the market.